I was asked to introduce and moderate this evening session with Vint Cerf in Singapore jointly organized by The Digital Movement and IDA. I didn’t take much notes but I managed to twitter a bit here and there during the session. 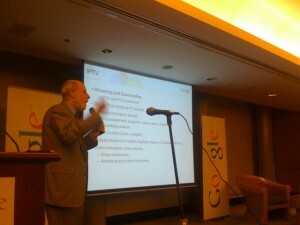 Vint Cerf is a great speaker and therefore really needs very little moderating nor prompting. On the other hand, I find myself fumbling quite a bit…looks like I am getting rusty at public speaking and presentation. But hey, the star of the show is Vint and he definitely took it! Okay enough fun for the evening and time to pack my stuff. I am going sailing for the next couple of days to Tioman, hopefully coming back alive. Wish me luck! This entry was posted on Friday, May 23rd, 2008 at 10:35 pm and is filed under Random Musing. You can follow any responses to this entry through the RSS 2.0 feed. Responses are currently closed, but you can trackback from your own site. All opinion and idea expressed here are my own and does not reflect the opinion of any organizations I am affiliated with.